Watching the snow blanket the infield tarp a couple hours before the scheduled first pitch, Class A South Bend starter Kyle Schepel wasn't even sure Sunday's game in Lansing would be played. Flakes continued to drift through the frigid Michigan air -- temperatures were barely above freezing -- but Schepel was able to take the mound for his second Minor League start. And as it turned out, the right-hander's performance was worth sticking around for. Schepel fired the fourth no-hitter in franchise history as the Class A Silver Hawks beat the host Lansing Lugnuts, 1-0, in the first game of a doubleheader. "It was snowing before the game for a while, even 30 minutes before we started it was still pretty chilly," he said. "After that, it was sunny the rest of the way. It turned out to be a nice day. "I'm pretty excited about it, it was fun. I was fortunate that I had good defense behind me and I was a little lucky as well which has to happen in a no-hitter. There were a couple hard-hit balls to [center fielder Breland Almadova] but they were hit right at him. And Alex Glenn made a sliding catch in left field, which was huge." Schepel retired the first 14 batters he faced before issuing a two-out walk to Santiago Nessy in the fifth inning. But the 22-year-old struck out next batter Carlos Ramirez to end Lansing's lone threat, and he set down the side in order in the final two frames to complete his historic performance. "I was trying to get ahead with the fastball and I was throwing a lot of strikes," said Schepel, who lost a no-hitter in the seventh inning of a game at Grand Valley State University in 2011. "It's been cold all week, all season, and hitters don't like the fastball in on their hands, so I was working that in and out. "I threw some cutters to get ahead and I worked in the curveball to change the pace. Then there was the split-finger change that I was throwing a lot. All four pitches were working for me." Schepel struck out at least one batter every inning and he induced five ground balls. Only two balls left the infield against the right-hander, playing an hour's drive east of where he grew up in Grand Rapids. "Both of my parents [Bob and Sue] Schepel were here and I think a couple friends. When I got back to the clubhouse, I had a bunch of texts. I talked to my parents between games and they were glad they were here. "They're happy they made it out here and they said they're thankful they live close enough to get to the games. I know they're proud of me." It was the third no-hitter in the Minors this year and the first solo no-no. Jake Snodgrass and Daryl Maday teamed up for Double-A Richmond on April 5 in a seven-inning no-hitter against New Britain. Last Sunday, Tyler Duffey, Josue Martinez and Tim Atherton combined on a nine-inning no-no for Class A Cedar Rapids against Beloit. In his professional debut against Bowling Green on April 6, Schepel allowed three runs on four hits and two walks while striking out five batters over six innings. He did not factor in the decision. "Last time, my mechanics were a little bit off and I was falling behind hitters and leaving the ball up," the 22-year-old said. "Tonight, I had control of all of my pitches and I was working down hill." Signed by the D-backs as an undrafted free agent, Schepel spent four seasons with Grand Valley, where he graduated as the team's all-time leader in wins (31) and strikeouts (259). 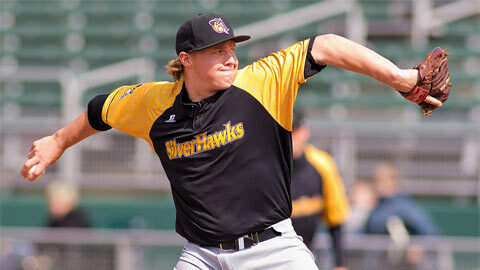 Last year, Schepel went 4-7 with a 3.66 ERA for the Rockford Riverhawks -- now Aviators -- of the Frontier League. He posted a 3.66 ERA in 16 games -- including 11 starts -- and he fanned 72 batters over 78 2/3 innings. "I grew up close to Grand Valley State University and I was able to stay close to home," he said. "I was fortunate enough to get a scholarship, and I had success there. I had a couple teams looking at me out of college, but nothing happened. "I got a spot on the Riverhawks and then I got invited to a tryout in Joliet, Ill., with 35 or 36 other Independent ball guys after the season ended. I was one of the few they ended up signing. I performed when it mattered most. I always knew I had the talent, I just had to get seen and recognized." Mike Girouard threw the first South Bend no-no on Aug. 22, 1988, against the Applewood Foxes when the team was called the White Sox. On April 21, 2000, four pitchers combined to no-hit the Peoria Chiefs. Most recently, Edgar Gonzalez no-hit the West Michigan Whitecaps on April 14, 2002.